This interview was conducted by Tenzin Dickie. She is a writer and literary translator living in NYC. She is editor of Old Demons, New Deities: Twenty One Short Stories From Tibet, forthcoming from OR Books in October 2017. Bhuchung D. Sonam, resident poet and publisher of Dharamsala, is a busy man. His last book, Zara Ziri, is a slim volume of whimsical poems in Tibetan. It pays homage to the Sixth Dalai Lama, one of Bhuchung’s most important artistic influences. His next book, Burning the Sun’s Braids, an English translation of the best new poetry from Tibet, is soon to be out from Blackneck Books. 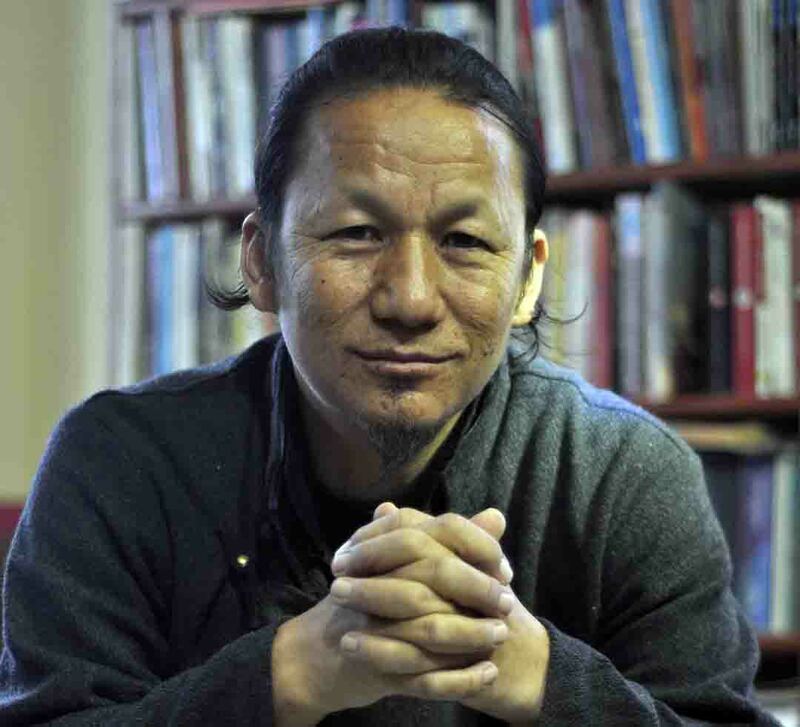 He has an impressive body of work, which includes 2012’s Yak Horns: Notes on Contemporary Tibetan Writing, Music, Film and Politics, an influential work of contemporary criticism. He is one of our best critics and one of our most important translators. He is also among a handful of truly bilingual writers—Pema Tseden, who writes in both Tibetan and Chinese, is another gifted example. In 2013 I moderated a conversation between Bhuchung D. Sonam and Tsering Wangmo Dhompa at Columbia University. Hosted by Our Word, a student group in the writing program dedicated to promoting diversity in literature, the discussion focused on their writing lives. Bhuchung said something that always stayed with me. He said that when he wrote in Tibetan, he wrote about anything—love, play, friends, work… but when he wrote in English, it was always about Tibet, about the lost country. Language shapes content, the medium alters the message and for Bhuchung D. Sonam, the language of exile shapes that exile. He is more aware of the precise shape and dimension of our loss than we are, those of us born in exile. For one thing, his personal loss involves loss of contact with family that he has not seen since he left Tibet a long time ago. The writing is where the pain exits, he says. It’s also where the pain exists, made not only bearable but also meaningful. No wonder he’s so prolific, to our good fortune. Among the important, meaningful things Bhuchung does is his work as co-publisher, with the illustrious Tenzin Tsundue, of TibetWrites and Blackneck Books. TibetWrites is the first real deal, independent, non-samizdat and non-government publisher of Tibetan poetry. There’s a raving poetry scene across the McMahon line (inasmuch as poetry scenes can rave) but poetry publishers in Tibet are either government presses or underground presses. As such, TibetWrites (and its imprint Blackneck) is the first independent Tibetan poetry press in history. Since its inception, TibetWrites with Blackneck has done remarkable work finding and promoting new Tibetan writing. Two of the house’s newest poets are Kaysang and Ten Phun, whose works Broken Portraits and Sweet Butter Tea were my favorite purchases from Kalachakra this past January. Bhuchung D. Sonam also raises two beautiful boys with his wife, the respected journalist Tenzin Sangmo. As we began this interview on Skype, Bhuchung said to his sons, ‘Now Pala has to do an interview. You guys be quiet, okay?’ And they were, very very quiet. TD: You are a poet, essayist, story writer, translator, intellectual, publisher etc etc. You wear many hats and do a great many things. Who do you model your life after? Do you have any historical personalities who are influences in your life? BDS: I don’t really have one person as an influence but I have many people that I look up to. From Tibetan history, I greatly look up to Milarepa and the Sixth Dalai Lama, and Dhondup Gyal and Gedun Chopel, of course. Their writings have influenced me, influenced the way I look at life and the way I write, particularly the Sixth Dalai Lama because of the way he wrote and how he wrote and the circumstances under which he wrote. What I write in Tibetan is overwhelming in his style — quartets, with each line having six words. There are other writers, Gabriel Garcia Marquez and Gunter Grass and Indian writers, new ones and others including my friend Pankaj Mishra. All of them and many other writers have influenced me but I don’t have one person whose life I have modeled myself after. TD: Your first book of poetry Dandelions of Tibet came out in 2002. Now you have three books of poetry and one poetry anthology that you have edited. What have you learned about writing poems? BDS: Oh, I don’t know. I don’t go back and visit my older books very much, especially Dandelions of Tibet—I don’t look at it really. If people ask about it, I try to avoid it. It’s such a terrible, terrible piece of junk, but it was published nevertheless. TD: But it must have been important for you to write it. That was your first book. BDS: Right, I have to accept the fact that it was my first book. I don’t like the other books also. Maybe there were one or two poems that were okay, but I don’t like to visit my books once I write them and especially once I publish them. I am absolutely not in love with what I write. Of the essays that I have written or the articles, they are not much of substance, the poetry even less so. There might be one or two poems that I like, and which might live for a while, but others pretty much go into the dustbin. TD: You are too hard on yourself. You are one of the most insightful and certainly one of the most prolific writers working today. In between 2002’s Dandelions of Tibet and 2012’s Yak Horns, you have written five books. In that decade, what has your experience been? What are your observations from being a writer? BDS: I don’t think of myself as a writer. I primarily write because it eases the pain of exile and dislocation, which is important. Because me and you and all of us at this point in time—we are all products of occupation and exile and dislocation and in the process we have accumulated a lot of pain, hurt, frustration and desperation inside and writing as a creative process helps me to deal with some of these things. That’s one thing. Regarding what has changed, what has evolved—I don’t know, I’m older, I have more wrinkles on my face. I have read more books definitely and I look at myself more harshly than ever before. I used to write poetry and you know, feel good about it, but I no longer feel good about the things that I write. Maybe it has to do with the fact that I read more books and with each book that I read, I feel less of myself as a writer and as a poet, because there are countless books that are so amazing that as an aspiring writer, I feel I will never be able to write. TD: You talked a little bit in the beginning about writers you admire. Can you talk more about those giants, your personal giants that you live up to and how their work is so meaningful to you? BDS: The foremost person that comes to my mind is Gabriel Garcia Marquez. I read his books again and again. It may have something to do with the fact that the world he was living in is similar in many ways to the world that we live in, with the chaos and confusion, and the economic circumstances, the belief system and the experiences, and the way he involves all his experiences into the fabric of his writing to create another world that is amazingly beautiful but at the same time reflects reality in the way that we experience it. Another is Gunter Grass. One particular book that comes to my mind is the Tin Drum written in 1959. The year is significant to us of course, and the story itself talks about life under Hitler and then during the war and all this chaos, confusion, challenge, destruction, mayhem, death, loss—all very much related to the things we undergo now. And of course we know the writing of our friend Pankaj—trying to make sense not only of India but also Asia where we live and figuring out what it means to be an Asian at this point of time in our history. TD: What made you want to become a writer? BDS: I don’t consider myself as a writer and if there’s any substance to what I write, I’m lucky. I write not because I am gifted or because I have special things to say, but because it helps me deal with myself, to move along in life. And in the process, through my personal experiences, through my own writing and narrative, I can tell the story of Tibet in a more human way, slightly detached from monks and prayer flags, lamas and caves and flying monks. Trying to tell the larger narrative and issue based on a personal experience hopefully creates more common ground for other people to come to understand Tibet, not as a place where people live happily ever after, but as a place with people like themselves. It’s a thread I try to untangle and straighten and shape. TD: Can you tell us more about your own personal story? BDS: I was born in a very small village in central Tibet called Riwoche. With 360 people, it was one of the largest villages around in our region. It was huge. (He laughs) At the time I was in Tibet, we had no electricity, no running water, no road, it was like living in the 18th or 19th century. It was a strange life, with the ruins of monasteries which reminded one of the destruction during the Cultural Revolution and older people talking about things that we were not supposed to hear. I know of evening meetings called by the Communist Party to inculcate love for Mao and Communism. I grew up in a world that was very small, very different and at the same time thoroughly penetrated by Chinese authorities in order to alter how people live, how people dress and fashion themselves, in their outlook, in the way they think and act. I came out of such a place. TD: And you came into India, into exile. What was that like? BDS: It was very strange. I came first into Nepal and I thought Nepal was going to be a holy place—a kind of a celestial place. I had an idea of a holy place with a lot of great stupas and great monasteries. When we landed in Nepal, it was raining and it was so chaotic. Even though it was winter it was very hot, humid, with lots of cars and terrible food—I had never seen or tasted anything other than boiled meat and radishes and tsampa and in Nepal, there was dal and chawal and sabzi… And India was even worse. First and foremost you were in a refugee school where everything’s limited. Everything is as bland as it could be. I couldn’t eat dal, I couldn’t eat banana- and in India if you can’t eat dal and banana, then you have to live on tingmo and rice. Everything was new, the food, the place, the people, and I transformed myself from a terribly naughty boy to a very shy, close-minded and scared boy. I became completely the opposite of who I was. TD: So you went to TCV (Upper and Lower). And then you went to Indian college in Ahmedabad. Can you talk about how those two different educational systems affected your growth and development? BDS: Was there growth? I don’t know. I had to study economics for three years simply because I got a scholarship to study economics. I had to follow certain things simply because of who I was. I studied economics—for five years I studied growth and development, investment, econometrics, profit and loss, supply and demand—while at the same time experiencing acute student poverty. But I was reading continuously and I was also writing. By the time I was graduating from St. Xavier’s College, I had about a hundred poems written in a notebook. Then one fine day I destroyed all of them, shredded the entire notebook and dumped the whole thing into the dustbin. I think it had something to do with the whole frustration of living that life—not being able to do what I wanted to do, and having to study something I didn’t want to study—and thinking that writing will take me nowhere and the study of economics will take me nowhere. Shredding that notebook was a momentary respite. TD: So you destroyed your first significant collection of poetry. Then what? How did you write the next collection? BDS: For a couple of years I didn’t write, I didn’t read much. I was detached from a lot of things. But ultimately it comes back—if you don’t kill yourself or you don’t smoke or do drugs, the pain has to find some kind of exit, some kind of pressure valve. For me fortunately it came out again in writing and I started writing again… I started writing in my notebooks every now and then. It wasn’t intentional, I didn’t intentionally start writing, it just kind of happened. TD: Can you talk about TibetWrites? What were the early challenges and experiences with TibetWrites? BDS: It was originally the idea of Tenzin Tsundue, a very good friend of mine, and Tenam who was then the editor of Tibetan Bulletin. They talked about this idea of a literary group. Then Tenam and Tsundue talked to me, and we discussed this idea of a kind of group where we can talk about literature and writing and expression. Tsundue knew a lot of young Tibetans and Tenam had his own experiences, and I had my own experiences of destroying a bunch of poems and having difficulty trying to find a place where Tibetan writing can be displayed before the international community, especially Tibetan writing in English. And so TibetWrites was born. TibetWrites was started as a website and then around 2006, we thought the virtual world is one thing and traditional publication is something else, probably more enduring. If we could get some of these publications into libraries and people’s reading rooms, then this might be more enduring. So we started publishing. In the beginning we had no idea about publishing, distribution, ISBN and all that. We just said, let’s publish and started publishing. We reprinted Kora. Tsundue by then already had two editions of his Kora, and we did the third edition of Tsundue’s Kora under TibetWrites’s name. I tried to figure things out. I looked at Penguin and HarperCollins and there was something called the ISBN. I looked closer at the publishing world and got in touch with the ISBN India office based in New Delhi. We received a response from them and registered with them. We got ten ISBN numbers which we exhausted very quickly—and then we sent them a series of letters to which we never got any response. Then I went to their office in Delhi and now we have one hundred ISBN numbers so now we are ready to publish one hundred books. So far we have published twenty-one titles. TD: Of these twenty-one, which one is your favorite and why? If you had to choose. BDS: I really like Kaysang’s Broken Portraits. Simply because she has a different voice and very different style. Unlike most of us she doesn’t shout “Free Tibet” or “I’m Tibetan” or anything like that but she writes very differently, very subtly. It’s a very small book, but it’s a very nice book. Although I totally didn’t understand all of it…perhaps one doesn’t have to. One of the things about poetry is its inexplicable and inexpressible meaning. It has to do with how you feel and how you enjoy what it is. It’s not like mathematics. TD: Can you talk about your writings? In The Tibetan Literary Sandbox, an insightful piece you wrote for Himal, you said that Tibetan fiction’s overused theme of politics and religion limits experimentation. Are there similarly overused themes in Tibetan poetry? Why is experimentation so important and how does one do that? BDS: I think the very nature of poetry is experimental. At least based on my own experience of writing. I write as things come to me and I hardly ever edit. I tend to believe that others do the same. There is no intentionally directing a poem to a certain direction to reflect certain themes which are prevalent in a community—maybe novels are slightly different because you think about a plot and theme and characters and everything is intentional and what comes out is overwhelmingly politics and religion. Fiction is freedom. And if you are limited—and as far as I know of the very limited Tibetan fiction that is produced, they all have something to do with monks or going to a monastery or becoming a lama—I see that as problematic. If all the Tibetan novels knock at the door of a monastery, where is the possibility of finding an alternative solution, an alternative way of thinking? TD: So what would you tell Tibetan fiction writers to do? BDS: I think you have to open your mind. Just be who you are, or who you want to be. Don’t bother too much about what the community wants you to do or be– don’t subscribe to the received wisdom or established social norms. These are to some extent very well taken care of by the existing social and religious institutions. As writers we have to create a different world, different possibilities — if we are to do that, we have to think likewise and write likewise. TD: Yak Horns is an incredibly important book. It’s perhaps the first book of Tibetan criticism and it contains deeply thoughtful pieces about Tibetan literature, film etc etc. Can you talk about the Tibetan history of criticism? How can we grow the criticism on contemporary Tibetan literature, on contemporary Tibetan literary and cultural arts? BDS: I think we have to be honest with ourselves. The truth is something else. But as artists, we have to be honest. We have to observe things properly – if we read a book and we feel a certain way or we have certain thoughts about the book or a piece of art, I think we should talk about it honestly. I have not studied any tradition of literary criticism or for that matter I haven’t studied literature as a subject matter so I have no authority to talk about the tradition of criticism. But we have to be honest as writers and artists – if we honestly talk about ourselves and others’ work, it forms a fair common ground to talk. TD: And it creates a national culture, and conversation. We are both editors of Tibetan Political Review. Can you talk about TPR’s role in Tibetan society? BDS: TPR is very important, I think. Exile Tibet is a very small community and we have certain groups associated with each province, each leader, each lama- each welfare society, each organization based on their political outlook. [In this environment], to have a nuanced and balanced, and at the same time, fearless opinion is very important. Especially in the time of elections, which is the final and most important test for a people’s political maturity, I think it’s important to have a voice of logic and reason, a voice that is at the same time balanced. So I think TPR plays an important role. Each piece is thought out, and trying to say something in the way it should be said, directly and openly but at the same time respectfully. TD: Tell us about your personal projects that you are working on and forthcoming books from Blackneck. BDS: I am translating some poems from Tibet by Thuerang, Gartse Jigme, Chen Metak and others. There are some forty poems in this book. I am finished with the translations and just waiting to publish it. I am currently translating a book by a former Tibetan diplomat. I am writing poetry here and there, in English and Tibetan. I am also working on a book about my life. It takes time. Forthcoming books from Blackneck includes Thubten Samphel’s non-fiction tentatively titled Tibet: Reports from Exile and Tsering Wangyal’s novel Another Place. But we don’t have money yet to print these books. Yes, Gabriel Garcia Marquez is a great writer and loved all.